Imagine a pristine mountain paradise where the people are friendly and the pace of life is unhurried. Picture a landscape undeveloped where natural amenities and the opportunities for recreation are limitless. Think of an enormous outdoor playground with more than 112,000 acres of National Forest. Welcome to Craig County, Virginia! Located in the Allegheny Mountains of Virginia in a region known as Virginia's Western Highlands, Craig County is criss-crossed with Virginia Scenic Byways -- Rt 311, Rt. 42 and Rt. 615. 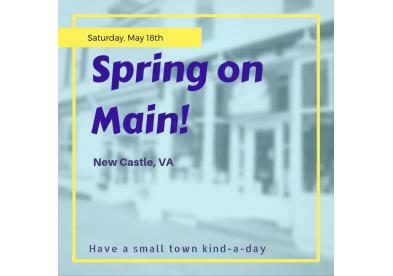 From Historic New Castle to the George Washington-Jefferson National Forest to the one-of-a kind charm of Paint Bank, there's something for everyone. Choose between fishing, hunting, birding, and primitive camping to hiking the Appalachian Trail. Bring your camera, your canoe or your camper. In New Castle shop at The Emporium, a modern-day general store open everyday but Monday. Travel back in time at the Old Brick Hotel, three restored log cabins, and our 1850's Courthouse. Check out events at the Craig County Fairgrounds on their Facebook page and mark Oct 12 on your calendar. That's the date of the 37th Annual Craig County Fall Festival. Craig County is within a day's drive of most of the American East Coast and is conveniently accessed via Interstate 81 north of Roanoke, Virginia. And feel free to stop and ask for directions, because you don't want to depend on your GPS system. We look forward to seeing you! Directions: The Craig County Visitor's Center is located in the Craig County Public Library at the corner of Main Street and Route 311 in New Castle. From Interstate 81, take Exit 141 or 140 and follow the signs to Rt. 311 north, turning at the stoplight. Go over Catawba Mountain, past the Homeplace and into Craig County where Rt. 311 becomes Craig Valley Drive. New Castle is approximately 20 miles from I-81. ask for directions; don't trust your GPS! Additional Information: For information call 540 864-5010, 864-5004 or visit www.craigcountyva.gov.